We’ve been loving painting lately and this simple toddler handprint painting activity is an easy to set, sensory painting experience. Be prepared to get a little messy but that’s all part of the fun with a toddler painting activity. Toddlers explore their surroundings with fingers and hands, often getting into everything within reach. A finger painting activity is a great way to encourage some hands-on discovery with the added benefit of fine motor and sensory play. 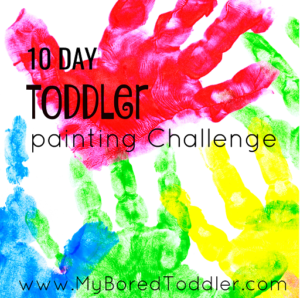 We’ve just finished a 10 Day Toddler Painting Challenge (you can find all of those activities and more HERE) and it was a huge success where we did finger painting. Today we’re going one step further and using handprints! Kids love the bright colors and the feel of the paint on their hands. They love making swirling motions in the paint to observe the resulting shapes and designs. 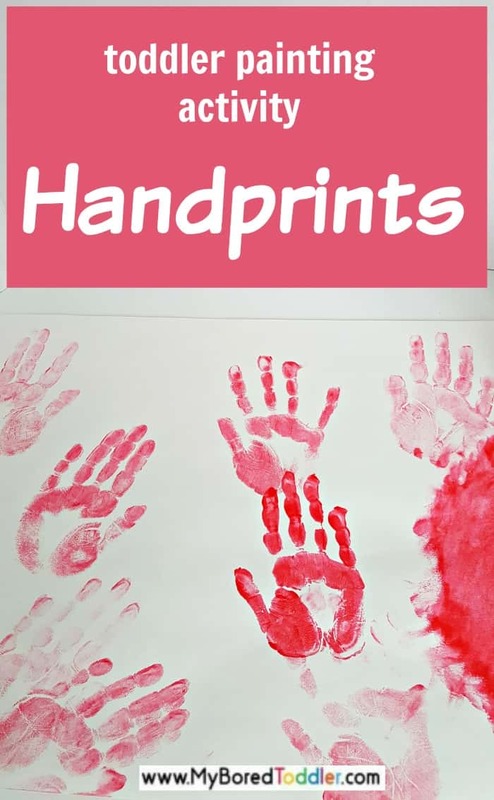 You can save a handprint from this activity as a keepsake to remember the size of your toddler’s hand as he grows. They make great keepsakes if you put them on canvases like these ones. You can find a full list of my essential painting items for toddlers HERE. 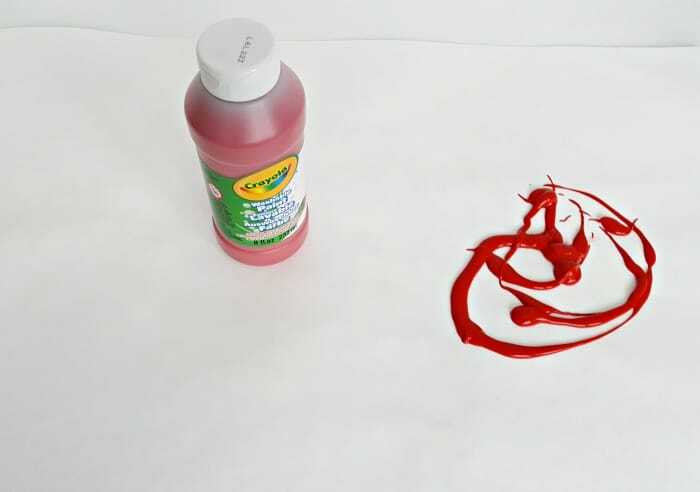 Drop of blob of paint on one side of the paper. Encourage your toddler to place one hand in the paint and swipe around to coat the palm and fingers, making a large round paint ‘pool’. Show your toddler how to press one hand firmly on the blank section of the paper, next to the paint ‘pool’. 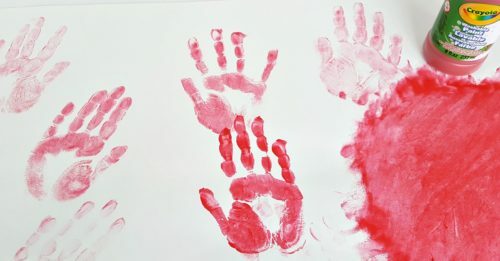 Continue making handprints until you run out of paint, then go back to the paint pool and reload! 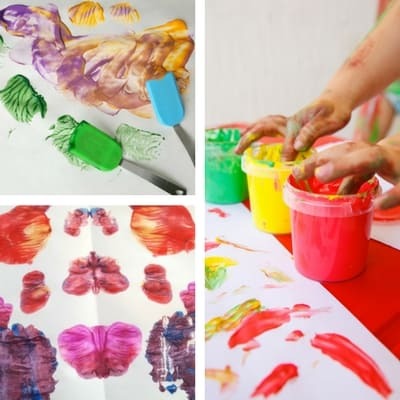 There are lots of ways for your toddler to enjoy this painting activity. A simple handprint painting activity is one that requires few supplies and no instructions but the benefits to your toddler are amazing! 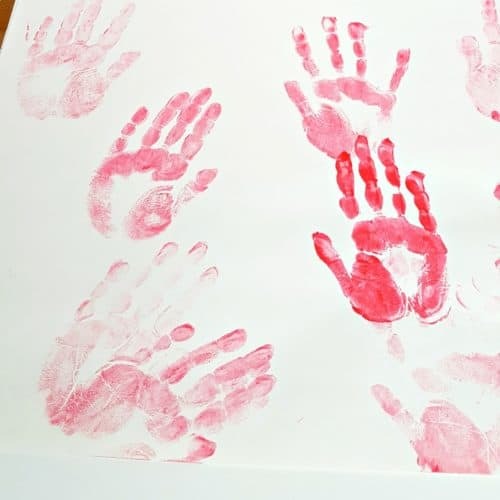 Painting with hands and fingers offers possibilities for language development as you talk about the designs and colors; sensory experiences as kids swish their fingers and hands around in the paint; and creative engagement as kids make handprints and other designs on the paper. A little mess in a toddler activity can go a long way towards development of early learning skills. Enjoy your young artist!